Critic and historian Charles Barr, in his 1976 article "Blackmail: Silent and Sound", in which he closely compares the two versions, notes that the silent version shows Hitchcock striving to escape a 'theatrical' style in which the action is generally viewed face on, with the camera occupying the position of the 'fourth wall'. In a theatre, this represents the position of the proscenium arch, which marks the boundary between a conventional stage and the audience. Although 1929 was rather late for a "first" sound film, the delay enabled Hitchcock to produce an advanced meditation on the possible uses of sound. The text incorporates silent footage (lifted whole from the original silent version, made immediately prior to the sound version), which allows for a series of comparisons/contrasts between sound and silents/silence. The conceit of this early sound film is an attempt to keep a man silent (paying off a blackmailer). The heroine spends over a third of the film virtually speechless. When she finally speaks, her boyfriend urges her to keep quiet. The dialogue is laughably banal, yet the right word can cut like a knife. The opening scene, an exciting silent chase, is immediately contrasted with a poorly dubbed, confusingly cut dialogue scene that seems as if it will never end. But before we glibly assume silents were "better" movies, sound becomes a moral force, while silence is linked with corruption and moral lassitude. Hitchcock first makes us aware that he is distorting the sound track subjectively when he exaggerates the loudness of bird chirpings to stress Alice's agitation on the morning after the murder. When the mother enters Alice's bedroom to wake her, she uncovers the cage of Alice's canary. Once the mother leaves the room, the bird's chirping is loudly insistent while the girl takes off the clothes she wore the night before and puts on fresh ones. The chirps are loudest, unnaturally so, when she is looking at herself in the mirror, the most "interior" action she performs while dressing. The sound reminds us of the tiny, birdlike jerkings that the girl made immediately after stabbing the artist. Just after the knife sequence there is another subjective distortion of sound, when a customer rings a bell as he enters the store. We are in the breakfast parlor, and yet the bell resonates much more loudly than it does elsewhere in the film. The camera is on a close-up of Alice's face to indicate that it is her point of view, once again, from which we hear. One of the elements that Film Studies For Free appreciates most about online audiovisual film studies (film studies in digital video forms) are the phenomenological possibilities they offer viewers for the experiencing of moving image and sound juxtapositions in real time. We can synchronously feel, as well as know about, the comparisons they make. In other words, unlike written texts, they don't have to remove themselves from film-specific forms of meaning production to have their knowledge effects on us. Embedded above is FSFF's homemade example of this kind of simple, more or less medium-specific, eloquence: a real-time video juxtaposition, made for the purposes of scholarly comparison, of corresponding sequences from the silent and sound versions of Alfred Hitchcock's Blackmail (1929). It is a work intended to supplement the contribution of an earlier blog entry here, entitled Thrilling the Ears: Sound in Hitchcock's cinema in which the two sequences were separately embedded. But it is also intended to publicise FSFF's support, as ever, for the very relevant For the Love of Film Preservation Blogathon which will take place this year between May 13-18, 2012 . 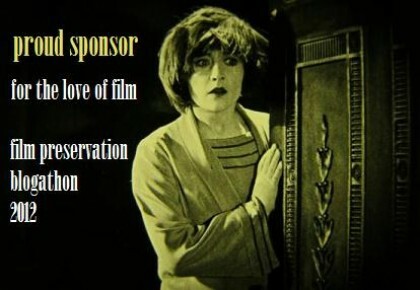 The blogathon has a Hitchcock theme and will support an important film preservation and dissemination project focusing on an early 'Hitchcock film': The White Shadow (1923). Good on ya, Catherine. Thanks again for your undying support. Just looked at these films in class today… Freaky. But very helpful! Thank you! I took a seminar on film sound with Karla Oeler at Emory University last fall and, as one might guess, we looked at (and listened to) these same two sequences. I think you are quite right, though, that having them side-by-side makes their at-times subtle differences emerge. This is a great showcase for what the web video can do for the discipline. Kudos! Thanks a lot, everyone. I have plans for some more of these kinds of comparisons!